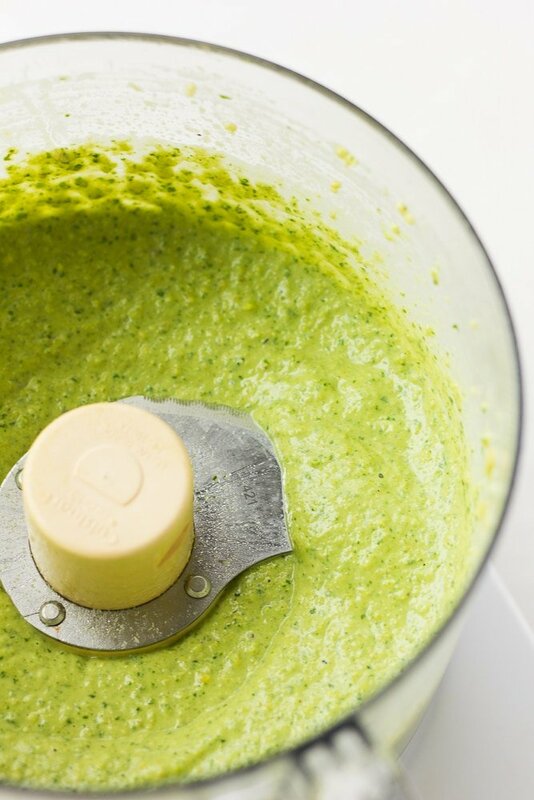 A vegan pesto recipe that is so simple to make with only 5 ingredients ( + salt/water ). Cashews are used in place of pine nuts and cheese for a budget friendly option. Oil free. Pesto usually involves nuts, cheese, garlic, fresh basil and olive oil. 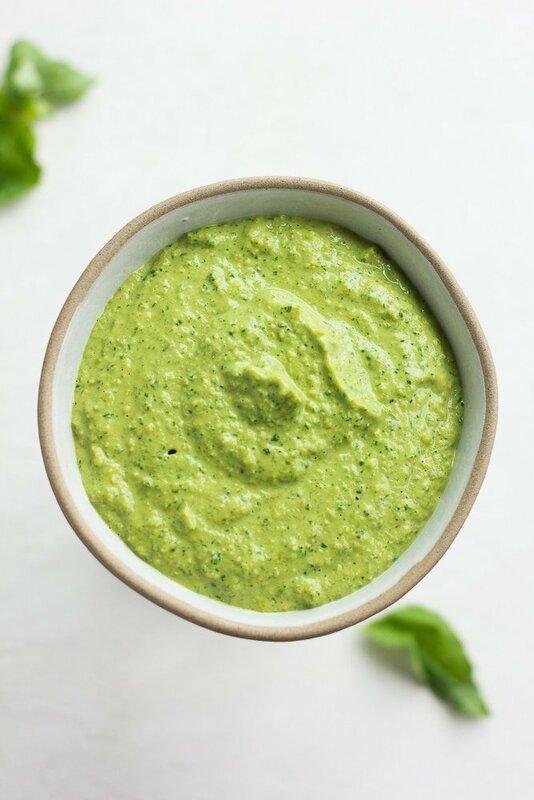 This is my favorite version of vegan pesto, which still has plenty of garlic and fresh basil flavor, but is made without any cheese or olive oil! The cashews provide a buttery, cheesy taste and are a lot cheaper than pine nuts, which are often called for in pesto. I think you are going to love it! Try it with any kind of pasta you like for a super quick and fancy meal, or use it on pizza, sandwiches, wraps, as a dip or salad dressing. 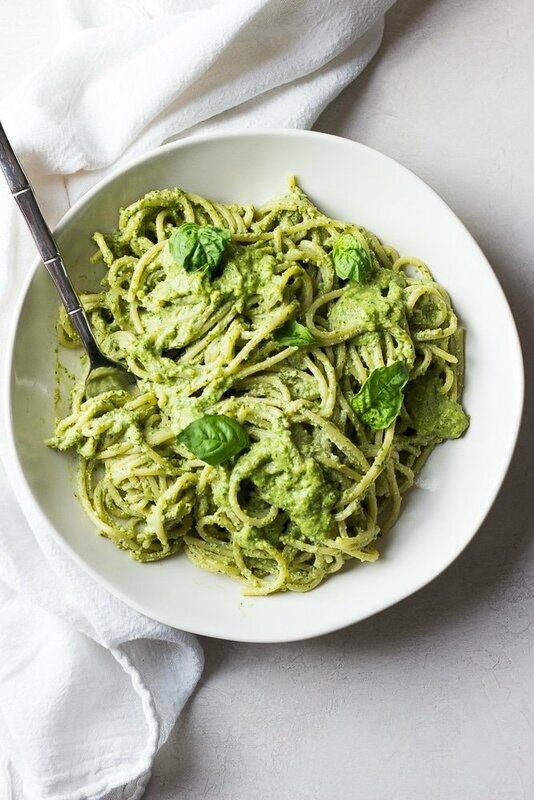 The possibilities are endless, and I just know this will be your new go-to pesto recipe! 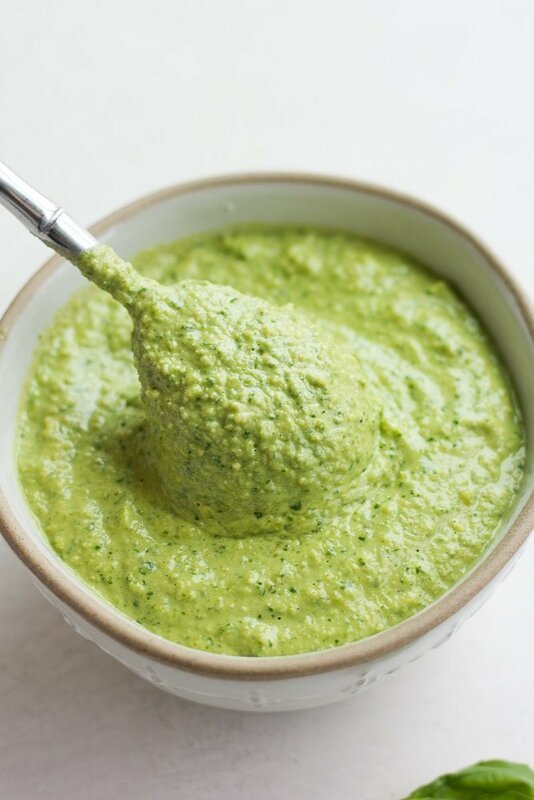 How do you make simple vegan pesto? It really couldn’t be easier! Add all the ingredients plus 1 1/2 cups water to a food processor. Process until smooth and creamy, adding more water as desired. For pizza, a dip or a sandwich spread, I like it a bit thicker. If I’m going to use it with pasta, I like a runnier consistency so I will use an extra 1/2 cup of water. 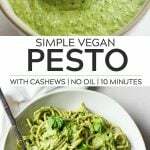 Simple Vegan Pesto is good everywhere! Can you make pesto nut free? If you have an allergy to cashews, you can use raw slivered almonds or pine nuts in place of the cashews. If you can’t have any of those, you can use pepitas or sunflower seeds. But the recipe does taste best with cashews, as they give it a buttery, cheesy flavor. Yes, pesto is one of my favorite meals for freezing! In fact, I froze a version of this in preparation for the birth of my last child. To freeze, I recommend using an ice cube tray. You can freeze the pesto in the tray, then once frozen, pop them out and place in a large ziplock freezer bag or other container with a label, of course. When ready to eat, simply defrost a couple of cubes, or more as needed. 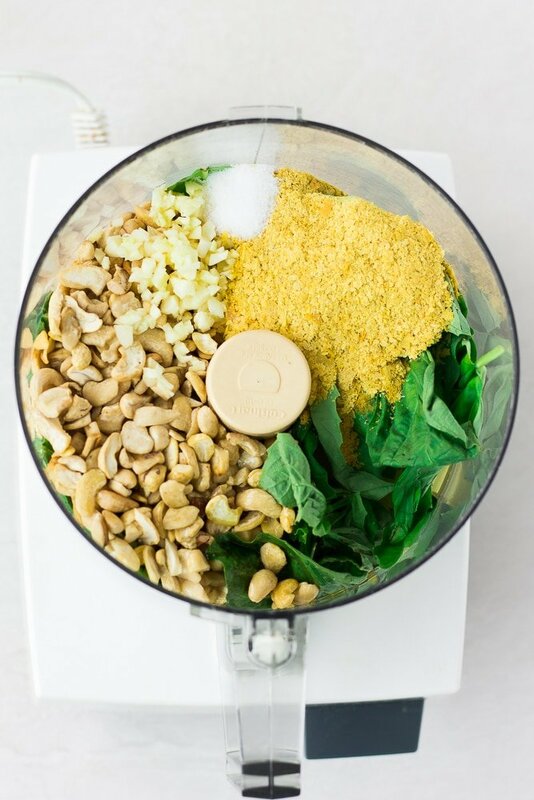 To a food processor, add the cashews, garlic, basil, nutritional yeast, lemon juice, salt and 1 1/2 cups water. Process until smooth, adding more water as desired for a thinner consistency. 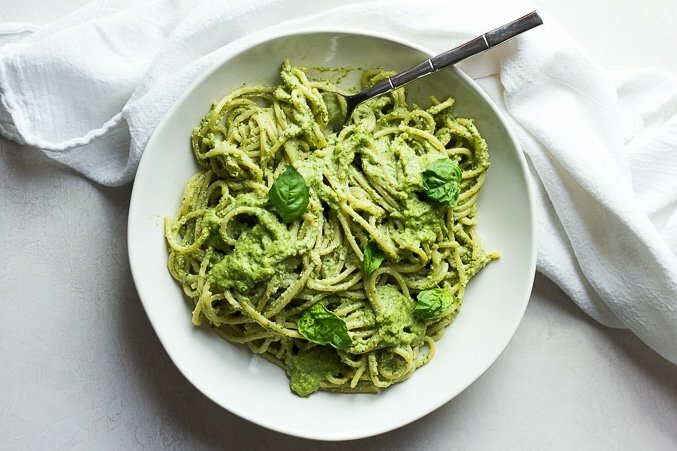 If serving with pasta, cook the noodles according to package instructions, then toss with the pesto, adding more water as needed to thin the pesto. Store in the refrigerator for up to 1 week. Pesto also freezes well for up to 6 months. I freeze it in an ice cube tray, then pop the cubes out and stick them in a ziplock freezer bag or container. 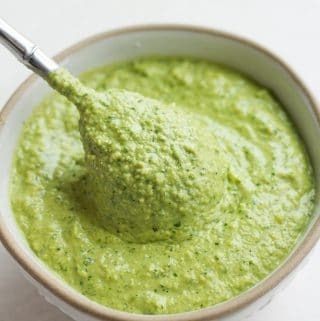 This vegan pesto goes great with any kind of pasta, on pizza, as a dip with vegetables or pita chips, as a salad dressing (thinned out with water), or spread on a sandwich. The pesto will thicken up in the refrigerator. Simply thin it out with water each time you use it, as needed. Allergic to cashews? Use pine nuts, pepitas, sunflower seeds or raw slivered almonds.